FACEIT Major 2018, the most important tournament of the year, where the best of the best will battle it out, is almost here. One million dollars is at stake and the winner goes home with half of the prize pool. The tournament will feature sixteen teams, half of them are invited due to their placings at the last major, while the rest need to qualify to secure a spot. 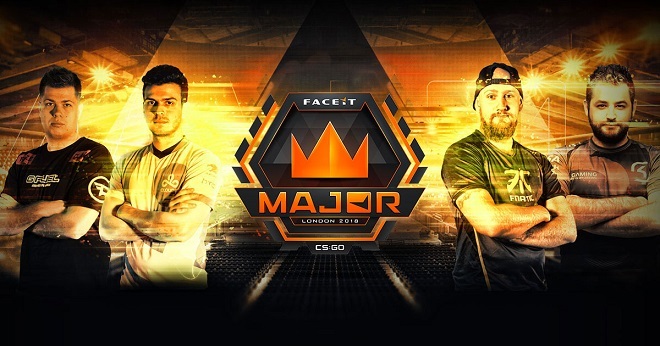 The major starts on September 12 and lasts until September 23, 2018, and takes place in London, United Kingdom. Esportsbets24.com gives you the ultimate Faceit Major 2018 betting guide. In this guide, we have prepared odds comparison, predictions, analysis and a tournament schedule. Continue reading and get ready to place your bets! Which team will prevail at the Faceit Major? In this section, you’ll find the best odds! The majors are the tournaments which all teams are striving to win, because of the prestige and the million dollar prize pool. The easiest way to find out who the favorites are is by taking comparing odds. Most bookmakers follow the esports market closely and place the odds accordingly to how the teams have performed past months. And it seems like the bookmakers agree on the fact that there are six teams that are considered favorites heading to this major. Astralis, Natus Vincere, FaZe, Mousesports, MiBR and Team Liquid are all below 15 in odds. As our odds table clearly says we have Astralis, Na’Vi and FaZe as the teams who are most likely to win the whole thing. Can the Swedish giants Fnatic and NiP surprise? Both Fnatic and Ninjas in Pyjamas are ex-major winners. The Swedish CSGO scene was thriving at the early ages of Counter-Strike: Global Offensive but has been a disappointment lately. The latest example is fnatic exiting DH Sthlm 2018 as early as in the groups. NiP, on the other hand, secured a spot at the playoffs, however, their luck ended there, as they went out in the quarter-final. Given Fnatic’s top eight placement at the last major (Eleague), they’re among the so-called ’legends’ who are guaranteed a spot at the Faceit Major. However, Ninjas in Pyjamas has to go through a qualifier ( September 5-9) in order to compete in the main event. Fnatic, the former champs, are entering this competition as underdogs. So, if they manage to surprise everyone and go on to bring home the trophy, you can win as much as 15 times your money. The stakes are even higher if you believe NiP can come out on top in London, win up to 27 times your money at Esportsbetting.com. Betting on esports, Counter-Strike in particular makes it extra exciting to follow esports events and matches. And the economical factor surely doesn’t hurt, so, if you know your stuff you can get a decent payoff out of it during the Faceit major. Match betting is, together with outright winner, the most common betting types. But, there are a whole bunch of other betting types available for those who want to mix it up a little. Such as the team to win a specific map or reach the finals. The odds that we have mentioned so far are bets placed before a match has even started, but what if you want to bet during a match? In those cases, you need to turn to live betting. There are so much happening in a match of CS:GO, which makes for a lot of betting opportunities. So, if you’re good at reading and anticipating match sequences you should definitely try live odds. Bet on the team to get the first kill, win the pistol round and much more. CSGO majors are always the highlight of csgo players careers, it’s THE tournament to win. Sixteen teams are attending, but as the qualifier hasn’t been played yet the groups haven’t been drawn. More info will follow as the qualifier proceeds. Cloud9, FaZe, MiBR, Na’Vi, Winstrike, fnatic and mousesports. We will complete the list of participants as soon as the qualifier has finished (September 5-9). The concept of CSGO majors was introduced in 2013, and back then the prize pool was only $250,000, not a lot if you compare it to the $1,000,000 today. Valve, the creators of Counter-Strike has sponsored every major so far, including releasing Stickers and Souvenir Cases available to the viewers via so-called ’drops’.